وارویک دیویس (اینگیلیسجه: Warwick Davis) بریتانیالی فیلمین سناریو یازاری, فیلم یؤنئتمنی, فیلم یاپیمجی‌سی و اوْیونچو. ۳ فئوریه ۱۹۷۰ ‏ ایلینده دۆنیایا گؤز آچیب. 1982–گۆنوموز ایللر آراسیندا سینما ساحه‌سینده چالیشیب. ↑ Truitt, Brian (23 June 2010). 'Merlin' star Colin Morgan talks dragons and guest stars. USA Weekend. آرشیولنیب اصلی نۆسخه‌دن on 7 August 2012. یوْخلانیلیب24 June 2010. ↑ Error on call to Şablon:cite web: Parameters url and title must be specified. یوْخلانیلیب12 November 2012. ↑ Hollywood actor Warwick Davis shoots for 'Chingari'. The Times of India (3 July 2012). یوْخلانیلیب17 March 2013. ↑ Error on call to Şablon:cite web: Parameters url and title must be specified (7 November 2012). یوْخلانیلیب11 November 2012. ↑ BBC One – Catherine Tate's Nan, Series 1, Nanger Management – Credits. BBC. ↑ Planet's Got Talent comes to ITV. "ITV Press Centre". ↑ 4.30pm-5.00pm (1970-01-01). The Dumping Ground - Media Centre. BBC. یوْخلانیلیب2016-11-16. ↑ British Comedy Guide (2016-08-23). Eric Idle to resurrect Rutland Weekend Television - News - British Comedy Guide. Comedy.co.uk. یوْخلانیلیب2016-11-16. ↑ Chung, Frank. "Warwick Davis on Star Wars: Episode VIII ‘cliffhanger’, possible Willow sequel". Retrieved 30 September 2016. ↑ Warwick Davis to Host Star Wars Celebration Chicago 2019. 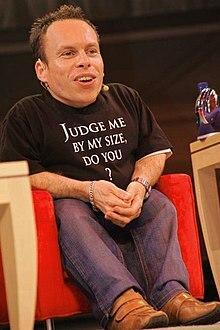 اینگیلیسجه ویکی‌پدیاسی‌نین ایشلدنلری طرفیندن یارانمیش«Warwick Davis»، مقاله‌سیندن گؤتورولوبدور. ( ۲۲ ژانویه ۲۰۱۸ تاریخینده یوْخلانیلیبدیر). قارداش پروژه‌لرده وارویک دیویس گؤره داها آرتیق بیلگی‌لر تاپابیلرسینیز.